Blade runner and LAPD Officer, K (Ryan Gosling), unearths a long-buried secret that has the potential to plunge what’s left of society into chaos and war. K’s discovery forces him to question all that he thought he knew and leads him on a quest for answers. Answers only Rick Deckard (Harrison Ford), a former LAPD blade runner who has been missing for 30 years, can provide. If I had to describe Blade Runner 2049 in one word, that word would be immersive. I left my screening of this film feeling stunned and disoriented. I almost expected to exit the cinema onto the dusty, hopeless streets of Los Angeles 2049. I had fallen so deep into Denis Villeneuve’s world that it was difficult to return to reality. Much like Ridley Scott’s 1982 original, Blade Runner 2049 is visually stunning and endlessly cinematic. Cinematographer (and surely soon to be Oscar winner), Roger Deakins, places us in familiar territory, while also revealing astonishing fresh developments (light for dark to reflect the Earth's new climate) and ever more impressive sci fi treats. Meanwhile, we are also drawn into Blade Runner 2049’s story thanks to the film’s incredibly powerful soundscape (by Benjamin Wallfisch and Hans Zimmer). It is, at times, an assault on the ears - making the entire screening room rumble and shake. It is in this breathtaking, yet austere landscape that we find K. He is a new form of replicant - one designed (by the Wallace Corporation - the successor to the Tyrell Corporation) to obey. Ryan Gosling plays this role to perfection. Despite the violence inherent in his job, he lives an otherwise passive, unquestioning life. Autonomy is not an option. However, when K’s boss, Lieutenant Joshi (a strong performance from Robin Wright), orders him to investigate a shocking discovery, she unwittingly ignites K’s repressed desire for a more meaningful existence - a desire (shared by Rutger Hauer’s Roy Batty) for what we humans call a soul. K’s journey takes him to many locations in and around dystopian LA as he slowly pieces the mysterious puzzle together. The key word here is slow. There are no frenetic jump cuts here. Villeneuve’s film (with its hefty 2hr 43min running time) is in no hurry to reach its final destination. The (some say meandering, I say thoughtful) pace of Blade Runner 2949 reveals the film’s confidence in its story, set design and special effects. There are several truly astonishing scenes - many of them involving K’s fascinating relationship with Ana de Armas’ Joi - and we are allowed the space to marvel. We have the time to absorb Deakins’ beautiful sights and Zimmer’s atmospheric sounds while, at the same time, also contemplating the film’s philosophical and thought-provoking themes of identity, racism, our relationship with technology and the meaning of our existence. It is not verging into spoiler territory to mention that K’s investigation leads him to the door of one Rick Deckard. Reprising his iconic role, Harrison Ford gives a really powerful performance. We all know Ford can do grizzly charm and reluctant charisma, but here he gets the chance to go much deeper. Indeed, Ford carries much of Blade Runner 2049’s emotional weight. He is able to express much while in fact saying very little. We feel his pain, his grief and his loneliness - particularly in a key scene with Jared Leto’s monologue spouting Niander Wallace. However, despite his despair, we still detect a glimmer of hope within Deckard. We all dared to dream (but perhaps not of electric sheep) when we heard that Denis Villeneuve was directing the Blade Runner sequel. He certainly hasn’t let us down - cementing his position as one of the most impressive and exciting directors working in film today. Villeneuve has achieved something truly remarkable with Blade Runner 2049. This is a film that is all style and all substance. A movie that is both an intelligent art film and a stunningly cinematic and hugely entertaining blockbuster. A sequel that more than lives up to its original… and may even surpass it. I was struck by how respectful Villeneuve’s film is of Scott’s original. There is much enjoyment to be had in spotting the Blade Runner nods and references. However, the director is careful not to fall into fan service trap. Instead, he creates a world born of Blade Runner and then takes that world forward with a powerful new story. If you would like to find out more about director Denis Villeneuve, just click here! 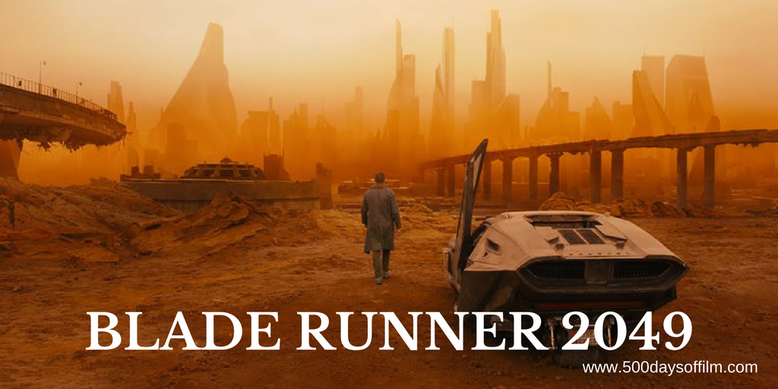 Have you seen Blade Runner 2049? If you have, what did you think about Denis Villeneuve’s film? Let me know in the comments section below or over on Facebook of Twitter (@500DaysOfFilm). Great review Jane. I was more awed by the style than the substance, but that isn't to say that it was empty, it does give plenty to think about. You hit the nail on the head with the fine line balanced between homage/fan servicing and building your own world/film. It does this perfectly. Denis Villeneuve is definitely one of the top directors working at the moment. Everything he does just oozes class in terms of his work but also the people that he brings in to do the job (and definitely none more so that the legend that is Roger Deakins!). Long may he bring us films of this standard! What did you think of the way that all the females in this film are portrayed? It certainly continues on from the issues that have dogged the original for years, albeit in different ways. I have heard a few people being concerned with this aspect and was just wondering what you thought. That being said, I'm seeing it again next week and am looking forward to it very much. I'm first in line for anything Denis Villeneuve creates in the future... he is such a brilliant director. It just breaks my heart to hear his film described as a 'flop'. I believe that it will become a classic (probably following in the footsteps of the original) but I want it to be a commercial success so that we can have more gorgeous and intelligent films from such visionary writers, directors, cinematographers etc. I do understand the concern about the portrayal of women in this film. However, I felt that this was somewhat deliberate... making a point that the world had been dominated by men who then objectified women but that that was on the cusp of change. Plus, for me, all of the most interesting characters were female. So (sorry for rambling!) I didn't have a problem here. Hope you enjoy your second viewing of Blade Runner 2049... I think it needs several watches just to appreciate all of the detail!